The sitemap is unfortunately a commonly overlooked section to a website. However, it can be considered one of the most important parts to a website for a number of reasons. It allows search engine crawls to go through your content and index them to rank on search engine results pages (SERPs). They assist web users exploring your website, by making breadcrumbs for them to track the structure for an article they are viewing. Not only does a sitemap help your SEO ranking, it actually helps your traffic navigate around your website efficiently too. 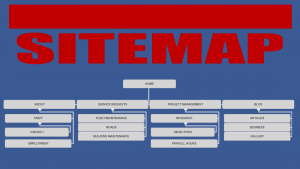 For this reason, here are some tips to consider when you create and generate a sitemap for your own website. A sitemap can be related quite closely to a general hierarchy diagram. At the top level are pages that are the most important, with each level below it getting less and less important. In general, the homepage is the most important, followed by your standalone pages (such as ‘About’, ‘Contact’ etc.) whilst your categories are also very important. The content of your website should be below your categories. By creating a hierarchy diagram will better help you plan out your website’s structure, for which the sitemap will be based on. For example, you might want certain categories having more important-weighting than other categories, instead of all the categories being the same level of importance. What is Your URL Structure? For the majority of websites, they will have software and plugins that will automatically create a sitemap for their website, as well as continually update the sitemap when new content is created. This is great. However, be warned that errors can still appear when sitemaps are automatically generated. For this reason, it is vitally important to scan through the auto-generated sitemap, to make sure there are no errors you can see. Errors in a sitemap can have fundamental negative impacts to a website’s ranking on search engines. You should also try and get into the habit of staying up to date with messages from Google Webmasters Search Console, since this commonly is the first place you will see errors, if they do appear, for your sitemap. After creating your sitemap, remember it is vitally important to submit your sitemap to search engines. If you don’t there is no guarantee at all that your website will be indexed by search engines. Consider submitting your sitemap to the biggest three search engines, being Google, Bing and Yahoo. Ezoic Review AdSense Partner Response: Top 7 Tips on ad testing and layout testing.